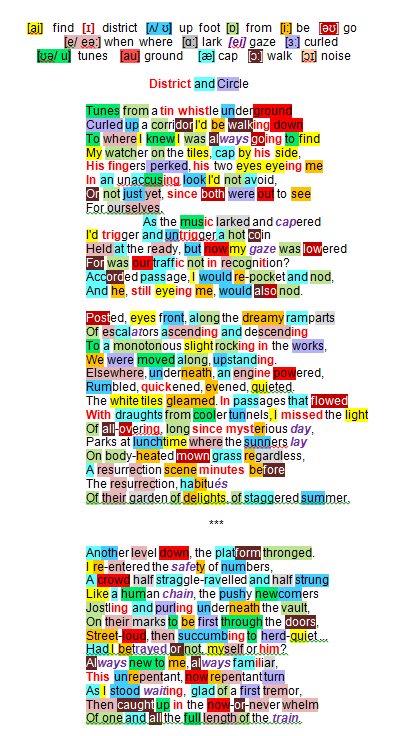 A sequence of 5 sonnets bears the title Heaney chose for the collection as a volume, after long consideration of alternatives. The poems are based on his memories of early-days’ vacation work in London, tempered by subsequent terrorist attacks on London transport. Heaney weaves mythological images of the underworld into the corridors and levels of the London ‘tube’. Heaney recalled to DOD that he ‘removed 2 sonnets from the ‘Tollund Man’ sequence to form ‘a separate diptych’. The initial piece has to do with mutual recognition – the speaker anticipates meeting a kindred spirit amongst the ‘shades’ that move along the underground space, The protagonists are an Orpheus-like busker and a young man/poet. The tenses used indicate that this event happened regularly. Only two people are involved initially. He leads us down a tunnel towards tunes that curled up (his synaesthetic effect turns sound that you can hear into something you can see). He knows from experience the point at which he will reach his cheerful busker (my watcher on the tiles) playing for coins tossed in his direction by appreciative passers-by cap by his side. He notes a ‘fellow-artist’s’ musical posture and his stare: fingers perked … two eyes eying me. He has concluded that the man is not playing on his generosity (an unaccusing look) and that he can unashamedly hold his gaze (I’d not avoid). He accepts that they are sizing each other up – both were out to see for ourselves. He recalls the playful lightness of a music that larked and capered … he is torn on this and other occasions as to whether to throw in money or not: I’d trigger and untrigger a hot coin, conjuring up the western film ‘shoot-out’ mentality when opposing wills come face to face. He does lower his eyes to accompany his decision to hang on to his money offering a reason for his stinginess: their businesses are not about performance and reward (was our traffic not in recognition) both of them struggling to make ends meet. Mutual recognition acts as a ‘pass friend’: accorded passage, I would repocket and nod, and he, still eying me, would also nod. ‘People moving’ become ‘people moved’: they proceed military-automaton-like (Posted, eyes forward) through a transitional section of the Underground system crisscrossed by escalators, ascending and descending – in line, akin to imaginary half bodies visible above the dreamy rampart of the handrail arriving from an elsewhere world accompanied by a monotonous slight rocking in the works – in sum conveyor belts of erect figures were moved along upstanding. Heaney adds a crescendo and decrescendo of sound and momentum: an engine powered,/ Rumbled, quickened, evened, quieted … returns to sight: white tiles … adds touch: passages that flowed/ With draughts from cooler tunnels. Dim ‘underworld’ lighting creates a yearning in the young man (missed) for life above ground with its pervasive light in every corner all-overing, fast losing its reality (long since mysterious day) but attractive and appealing: parks at lunchtime …body-heated mown grass. The metaphor is of Virgilian resurrection, whereby he anticipates eventual light at the end of the tunnel (a resurrection scene minutes before the resurrection) and release back into the real world, from darkness to light, from death to life, to find himself amongst the sensual habitués/ Of their garden of delights and staggered summer. Descending deeper into the network he emerges onto a platform, thronged, from aloneness to the safety of numbers with its connotations of refuge from potential threats. The same Tube tunnels of WWII that protected the London population from Hitler’s ‘Blitz’ are no longer a refuge from the enemy within (following the terrorist attacks of July 2005). 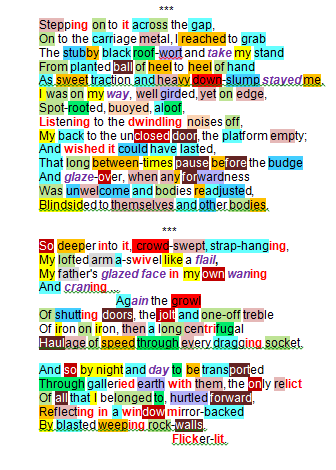 The poet’s creative imagination seeks to convey the group dynamics – people in a cluster but not a scrum words (throng half straggle-ravelled , some like beads in an orderly line half strung like a human chain; others are perceived as self-interested (pushy/ Jostling), purling, at once part of a pattern and a swirl and a liquidy sound (purling) beneath the low, curved ceiling. As if waiting for a starting gun to get on the train they are already on their marks their voices reduced from street-loud to herd-quiet. As he stands waiting he revisits the busker situation: he gave the man nothing – does this unrepentant, now repentant turn of conscience mean he was stingy or disloyal towards a fellow creative spirit? Imminent relief: he is glad that the first tremor of the approaching tube train puts an end to his concern but, inevitably, is caught up in the now-or-never whelm/ Of one and all carrying him powerless towards the open doors. Heaney treats us to an in-depth description of the physical forces exerted on the human body by Tube travel and how he occupied his mind. He positions himself as of habit for the strains and dynamics of departure taking hold of straphanger (stubby black root-wort) and securing his stance above and below (from planted ball of heel to heel of hand). His body becomes conscious of pressures that will make movement increasingly difficult: sweet traction and heavy down-slump stayed me. His journey is starting (on my way), he is securely ‘harnessed’ (well girded) and stressed (on edge) … confined to a single position (spot-rooted), as if held erect (buoyed) self-engrossed (aloof). Sound is in retreat (dwindling noises off), the last man to board (platform empty). The final seconds (long between-times pause) of inertia before the budge, when both the windowed doors and his consciousness glaze over then an unwelcome force that require a rebalancing to cope with the laws of motion and personal space: blindsided to themselves and other bodies. The train moves from lighted platform into a pitch-black tunnel: Deeper into it. The speaker is subjected to mass movement (crowd-swept) but anchored (strap-hanging), his lofted arm hyper-responsive to widely varying forces (a-swivel like a flail). Suddenly like Aeneas (who in Aenied Book 6 who sought an underworld meeting with his dead father) Heaney catches a fleeting glimpse (my father’s glazed face in my own) that makes the human chain of life and death only too clear as he seeks to retain it waning and craning. He relives the station stops-and-starts: the animal growl of shutting doors… the abrupt jolt the high-pitched one-off treble of iron on iron … the physics of pulling-away (a long centrifugal haulage felt in every joint in his body: through every dragging socket. Tinges of pathos and regret increase as the poet reflects on his erstwhile daily routine transported through galleried earth , the only survivor of his previous generation: the only relict of all that I belonged to. Both his journey and his time on earth hurtled forward at breakneck speed , almost film-like in a window whose reflections he recalls with a touch of elegy (mirror-backed) against blasted weeping rock walls. The emotional sub-text is that of a man in his sixties, only too aware of the journey from young manhood to old age. He pictures the window-mirror and his image in it as frames from an old film, Flicker-lit. .
multiple use of compound words; seven examples between crowd-swept to Flicker-lit.